LIFE HACKS #2329 YOGURT DROPS: SPOON SOME YOGURT INTO A PLA - ProudMummy.com the Web's Community for Mums. LIFE HACKS #2329 YOGURT DROPS: SPOON SOME YOGURT INTO A PLASTIC BAG. 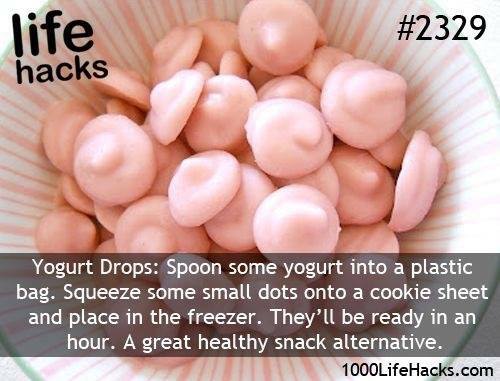 SQUEEZE SOME SMALL DOTS ONTO A COOKIE SHEET AND PLACE IN THE FREEZER. THEY'LL BE READY IN AN HOUR. A GREAT HEALTHY SNACK ALTERNATIVE.